Microsoft today announced the launch of its latest Office software suite, updating its applications for Windows machines to new 2013 versions and launching a new Office 365 subscription option. While the $99-per-year Office 365 option allows for installation on up to five computers, Mac users will continue to receive Office 2011 applications until an updated version of Office for Mac becomes available. Office for Mac versions typically follow about 12-18 months behind their Windows counterparts. Office 365 Home Premium is priced at $9.99 per month or $99 per year, while college and university students, faculty, and staff are eligible for Office 365 University priced at $79.99 for a four-year subscription. 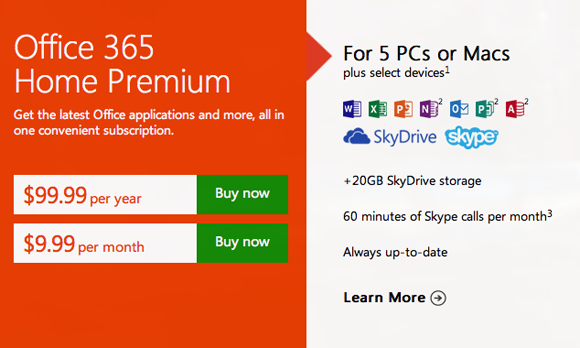 Aside from the Office 365 subscription plans, Windows users are also offered the option of standalone Office 2013 packages including Office Home & Student ($139.99), Office Home & Business ($219.99), and Office Professional ($399.99). There are no ongoing costs with the standalone installations, and a version of Office typically remains current for three years. Office for Mac 2011 also remains available as a standalone purchase, and users who purchase Office 2011 for Mac between October 19, 2012 and April 30, 2013 can shift over to a one-year Office 365 subscription free of charge. I got 99 Problems but Office ain't one. Anyone who thinks iWork or any other office replacement is a viable alternative to MS Office simply isn't a power user of excel. That doesn't absolve MS of responsibility though, since the Mac version of Excel is awful. MS is smart in this case. They know Excel is essentially required in business and keep the Mac version bad enough that people won't switch. As a home user I would not spend $99/year to keep my Office subscription. I'd move to iWork at that point. I paid the home price for 2011 when it came out and intend to keep using it. Open Office for Mac would be a nice choice too, at least it's free. Open Office is Open Ugly though. A bigger issue is people use Excel as a database. Its not a database! Word and Excel are basically the same product from the 90s. I wonder if it's an issue of patents. I find it incredible how the back end of Numbers hasn't been updated to be better than Excell in 20 years. I say back end, because I think the UI and usability of Numbers is much better than excell. as far as pages and keynote go, they are way better than microsoft office IMO. Apple have stopped major updates to the majority of their consumer software products. When was the last time iLife was updated (iPhoto, garage band, iMovie, iWeb ( discontinued ) and iWork? Years. Its just bug fixes, updates to support iCloud and smaller functionality updates here and there. Where is Apple's iWork upgrade? At least Microsoft updates their software eventually.